However, human health risks from exposure to low doses of ionizing radiation remains completely vague, and is the subject of intense debates. In the present study, we have used PBLs to investigate the effect of elapsed time on the modification of gene expression level up to one week following to low doses of ionizing radiation. Fifty milliliter whole blood samples were collected in individual tubes containing Ethylene Diamine Tetra-acetic acid (EDTA) from male volunteers. PBMCs were separated by Ficoll (Cedarlane) according to the recommendations of the manufacturer. The mononuclear cell layer was removed and washed in Phosphate Buffer Saline (PBS). 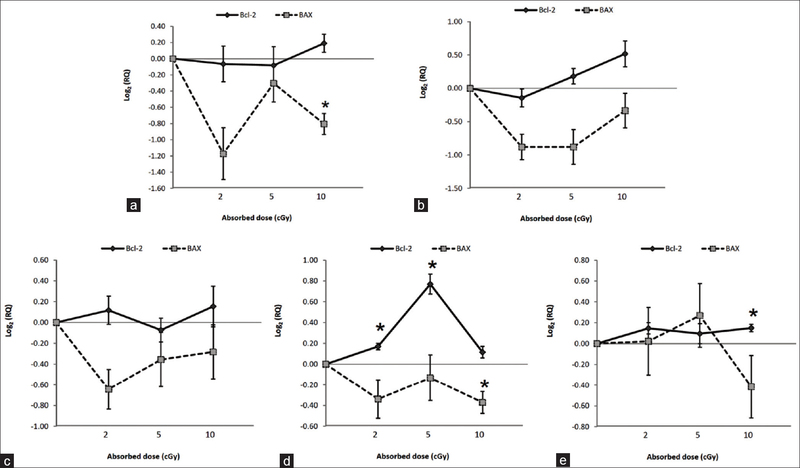 The cells were counted and re-suspended in a 10 ml culture medium, including RPMI 1640 (Gibco) containing 20% FBS (Biosera), 1% of 200 mM L-glutamine (Biosera), 100 Iu/ml penicillin, 0.1 μg/ml Streptomycin. Cells were transferred to four 25 cm 3 flasks (Spl) in a final cell concentration of 1 × 106 cells/ml. To study patterns of apoptotic genes' expression in human peripheral blood, lymphocytes were collected for ribonucleic acid (RNA) isolation from cultures 4 hours, 24 hours, 48 hours, 72 hours, and 168 hours following irradiation. The results are expected to help understanding early and delayed apoptotic response to ionizing radiation. Approximately 3 × 10 6 lymphocytes were taken for the subsequent isolation of RNA using the TriPure reagent (Roche Applied Science, Germany). The lymphocyte pellets were transferred into 750 μl TriPure reagent. Each sample was incubated for 5 minutes at room temperature and then 150 μl Chloroform (Merck, Darmstadt, Germany) was added to it. After vigorous manual shaking for a further 15 seconds, all samples were incubated at room temperature for 10 minutes. To separate the solution into three phases, the mixture was centrifuged at 12,000 g for 15 minutes at 4 o C. The colorless upper aqueous phase was transferred to a new centrifuge tube and 350 μl Isopropanol (Merck, Darmstadt, Germany) was added to it, then samples were incubated at room temperature for 10 minutes to allow the RNA precipitate to form. The solution was centrifuged at 12,000 g for 10 minutes at 4 o C. The supernatant was discarded, and the RNA pellets were washed with 75% Ethanol (Merck, Darmstadt, Germany), air-dried, and then resuspended in 20 μL DiEthylPyroCarbonate (DEPC)-treated RNase-free water. Complementary DNA (cDNA) synthesis was performed in a total volume of 20 μl, containing 200 U of M-MuLV Reverse Transcriptase, 4 μl of 5 × Reaction Buffer, 20 U of Ribolock TM RNase inhibitor, 2 μl of Deoxyribonucleotide triphosphate (final 1 mM), 1 μl of oligo (dt) 18 primer (0.5 μg), and 1 μg of total RNA. The prepared template with the control Glyceraldehyde 3-phosphate dehydrogenase (GAPDH) RNA and GAPDH control primers (1.3 kb) were used as a positive control, and no negative template control was prepared with total reagent for the reverse transcription reaction, except for the RNA template. cDNA was synthesized according to the manufacturer recommendations (RevertAid TM First Strand cDNA Synthesis Kit, Fermentas). Each cDNA was amplified by control polymerase chain reaction (PCR) reaction using primers for the GAPDH according to the manufacturer protocol (Prime Taq DNA polymerase, Genet Bio, South Korea). Five microliter of PCR product was loaded on 1% agarose gel and a distinct 496 bp was observed after Ethidium Bromide staining. Real-time RT-PCR reactions were carried out in a MicroAmp™ Fast Optical 48-well reaction plate with Optical Adhesive Film (Applied Biosystems) as duplicates in a total volume of 15 μl, containing cDNA (1.5 μl), forward and reverse primers (300 nM), SYBR® Premix Ex Taq TM (7.5 μl) and ROX TM Reference Dye II (0.3 μl) (Takara, Japan) and dH 2 O 5.1 μl. Gene expression assessments were performed on a StepOne (48-well) Real-Time PCR system (Applied Biosystems). The samples were thermally cycled under the following conditions: First holds at 95°C for 60 seconds, followed by cycling at 95°C for 10 seconds (for 40 cycles) and finally 60°C for 30 seconds. After each run, the result was analyzed automatically once, with Step One software v. 2.1 (Applied Biosystems). The relative standard curve method was applied for cDNA quantification. This approach gives rise to a highly accurate quantitative results (quantity of an unknown sample is acquired from interpolation of the standard curves. The curve produced from the same samples for each plate)  The quantity of the target genes was normalized by quantity of Beta-2 Microglobulin (β2M) as the endogenous control gene (β2M was used as the housekeeping or "stably expressed" gene). To obtain final relative quantity (RQ); the normalized quantity of the treated samples were compared with the normalized quantity of the control sample. Primers were purchased from Metabion (Martinsried, Germany). Primer sequences were: β2M forward 5'- GTA TGC CTG CCG TGT GAA C-3', reverse 5'- AAC CTC CAT GAT GCT GCT TAC-3'; Bcl-2 forward 5'- TAC TTA AAA AAT ACA ACA TCA CAG-3', reverse 5'- GGA ACA CTT GAT TCT GGT G-3'; BAX forward 5'- GCT TCA GGG TTT CAT CCA G-3', reverse 5'- GGC GGC AAT CAT CCT CTG-3'. Human whole blood samples were collected from four healthy volunteers, without any history of radiation therapy and they received no medication during this study [Table 1]. Relative quantitative RT-PCR method was employed to compare gene expression levels of treated and control groups. The results were expressed as the means and standard errors of the means (S.E.). All data were analyzed by Statistical Package for the Social Sciences (SPSS) 11.5 software. Mann-Whitney U-test was performed to compare average of gene expression level for irradiated and control groups, a P value ≤ 0.05 was considered statistically significant. The results indicate that when lymphocytes are exposed to 20, 50, and 100 mGy of gamma radiation; down-regulation is induced for BAX pro-apoptotic gene 4 hours, 24 hours, 48 hours, and 72 hours following irradiation [[Figure 1]a-d]. Expression of Bcl-2 anti-apoptotic gene was found to be up-regulated at doses as low as 20 mGy after 48 hours, 72 hours, and 168 hours following irradiation [[Figure 1]c-e]. The results also show that the Bcl-2 expression was induced by 50 mGy at 24 hours [[Figure 1]b], 72 hours [[Figure 1]d], and 168 hours [[Figure 1]e] following irradiation. In addition, up-regulation of Bcl-2 expression was induced by 100 mGy at 4 hours, 24 hours, 48 hours, 72 hours, and 168 hours after irradiation [[Figure 1]a-e]. In this study, the effect of elapsed time following exposure was also examined. Early down-regulation of BAX gene expression induced by 20, 50, and 100 mGy, 4 hours following irradiation is shown in [Figure 2]a-c. This phenomenon was terminated 168 hours after delivery of 20 and 50 mGy. 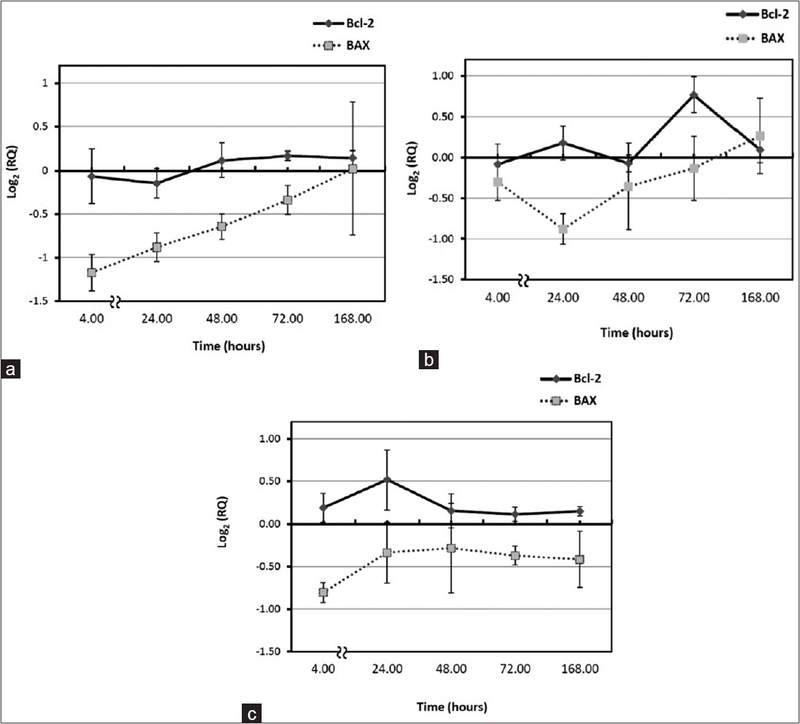 Maximum reduction in BAX gene expression was observed 4 hours following to 20 and 100 mGy [[Figure 2]a and b], similar result was observed 24 hours after 50 mGy [[Figure 2]c]. Low doses of gamma gave rise to up-regulation of Bcl-2 expression. The highest increase was noticed at 72 hours following to 50 mGy [[Figure 2]b], this was also true for delivery of 100 mGy at 24 hours after irradiation [[Figure 2]c]. The Bcl-2/BAX ratio has been introduced as a predictive marker for therapeutic response to radiotherapy and radio-sensitivity. ,, Particularly, the high ratio is considered as a crucial factor of cell resistance to apoptosis. This means that the sensitive cells are characterized by low Bcl-2/BAX ratio and resistant cells by high ratio. In other words, low doses of gamma radiation reduces radio-sensitivity of human peripheral blood lymphocytes. This is shown in [Figure 3] (a-c). Maximum rise in the Bcl-2/BAX ratio was observed 4 hours following to 20 and 100 mGy. Nevertheless, this phenomenon changed course and was almost eliminated 168 hours after 20 mGy gamma irradiation. However, this result may reflect the inter-individual variability between the donors [Table 1]. Bcl-2 family proteins control the cell response to radiation and regulate apoptosis. , Anti-apoptotic members of Bcl-2-family proteins are Bcl-2, Bcl-xl, Bcl-w, Mcl-1, Bfl1/A-1, and Bcl-B. Also, some pro-apoptotic members of the Bcl-2-family proteins are BAX, Bak, and Bok. The intrinsic pathway of apoptosis by adjusting the release of mitochondrial proteins, including cytochrome-c (cyt. c) controls the occurrence of apoptosis. The maximal induction appeared between 2-3 hours post-exposure for BAX in the human myeloid leukemia cell line ML-1 that was irradiated at approximately 51 mGy/min (total doses of 20-500 mGy of gamma rays), then rapidly declined to near control levels within 24 hours. While our study demonstrated that the expression peak of BAX is decreased at lower dose rates (13.7 mGy/min) (total doses of 20 and 100 mGy) at 4 hours post-exposure, also for 50 mGy at 24 hours post-exposure. On the other hand, a significant decrease in the expression level of BAX was observed in human PBMCs 4 hours post-exposure to 100 mGy. Although these changes faded with elapsed time, but a significant reduction in the expression level of the BAX gene was still noticed 72 hours following to 100 mGy dose. 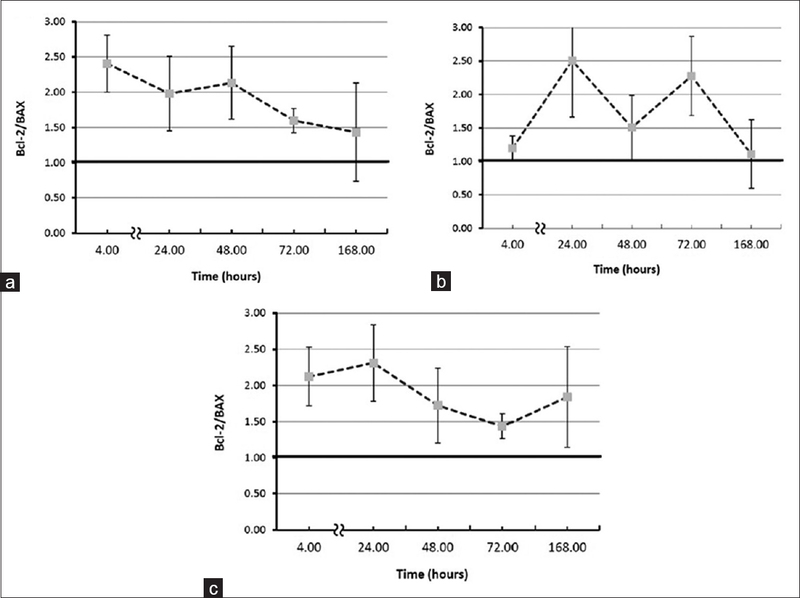 The Bcl-2/BAX ratio was significantly increased 4 and 72 hours following irradiation 20 mGy, and 4 hours, 24 hours, and 72 hours following irradiation 100 mGy (P < 0.05). The results of the present study have shown that low doses of gamma radiation can increase the Bcl-2/BAX ratio. This means that, although high doses of gamma radiation can cause apoptosis, the observed increase of the Bcl-2/BAX ratio is an indication that low doses of gamma radiation cause reduction of lymphocyte radio-sensitivity. Several researchers assessed cell radio-sensitivity by examining the level of apoptosis, they realized that it depends not only on dose value, but also on post-exposure elapsed time. , Some studies have suggested time-dependent expression,  particularly in the first 5 hours and a return to the base-line within 20 hours. But, in our study, these changes remained for a much long time and gradually faded over a week. Although, biological responses to low-dose ionizing radiation are exhibited in several ways, adaptive response is considered one of them. Induction of radio-adaptive response by low-level ionizing radiation was previously reported for protection against radiation induced chromosomal aberrations in human lymphocytes. Our results could support the hypothesis that the radioresistance effects of low dose exposure may be due to the up-regulated expression of Bcl-2 genes that may provide a survival advantage. Although other cellular radio-protection mechanisms may be involved, such as alterations in the levels of some cytoplasmic and nuclear proteins, DNA repair, and other processes. There are some limitations in this study, the main one being the interindividual variability between the donors. It has to be emphasized that the results presented in this article are preliminary results of an ongoing research work. The authors would like to thank the office of vice president for research of Mashhad University of Medical Sciences for funding this work. Roos WP, Kaina B. DNA damage-induced cell death by apoptosis. Trends Mol Med 2006;12:440-50. Khanna KK, Jackson SP. DNA double-strand breaks: Signaling, repair and the cancer connection. Nat Genet 2001;27:247-54. Collins AR, Ferguson LR. DNA repair as a biomarker. Mutat Res 2012;736:2-4. Valerie K, Yacoub A, Hagan MP, Curiel DT, Fisher PB, Grant S, et al. Radiation-induced cell signaling: Inside-out and outside-in. Mol Cancer Ther 2007;6:789-801. Dainiak N, Schreyer SK, Albanese J. The search for mRNA biomarkers: Global quantification of transcriptional and translational responses to ionising radiation. BJR Suppl 2005;27:114-22. Brown JM, Wilson G. Apoptosis genes and resistance to cancer therapy: What does the experimental and clinical data tell us? Cancer Biol Ther 2003;2:477-90. Reed JC, Pellecchia M. Apoptosis-based therapies for hematologic malignancies. Blood 2005;106:408-18. Furlong H, Mothersill C, Lyng FM, Howe O. Apoptosis is signalled early by low doses of ionizing radiation in a radiation-induced bystander effect. Mutat Res 2013;741:35-43. Qin J, Li L. Molecular anatomy of the DNA damage and replication checkpoints. Radiat Res 2003;159:139-48. Zhang C, Kang C, Wang P, Cao Y, Lv Z, Yu S, et al. MicroRNA-221 and-222 regulate radiation sensitivity by targeting the PTEN pathway. Int J Radiat Oncol Biol Phys 2011;80:240-8. Pernot E, Hall J, Baatout S, Benotmane MA, Blanchardon E, Bouffler S, et al. Ionizing radiation biomarkers for potential use in epidemiological studies. Mutat Rest 2012;751:258-86. Turtoi A, Brown I, Oskamp D, Schneeweiss FH. Early gene expression in human lymphocytes after gamma-irradiation-a genetic pattern with potential for biodosimetry. Int J Radiat Biol 2008;84:375-87. Grace MB, McLeland CB, Blakely WF. Real-time quantitative RT-PCR assay of GADD45 gene expression changes as a biomarker for radiation biodosimetry. Int J Radiat Biol 2002;78:1011-21. Amundson SA, Fornace AJ Jr. Gene expression profiles for monitoring radiation exposure. Radiat Prot Dosimetry 2001;97:11-6. Templin T, Paul S, Amundson SA, Young EF, Barker CA, Wolden SL, et al. Radiation-induced micro-RNA expression changes in peripheral blood cells of radiotherapy patients. Int J Radiat Oncol Biol Phys 2011;80:549-57. Anglin EJ, Salisbury C, Bailey S, Hor M, Macardle P, Fenech M, et al. Sorted cell microarrays as platforms for high-content informational bioassays. Lab Chip 2010;10:3413-21. Roy L, Gruel G, Vaurijoux A. Cell response to ionising radiation analysed by gene expression patterns. Ann Ist Super Sanita 2009;45:272-7. Falt S, Holmberg K, Lambert B, Wennborg A. Long-term global gene expression patterns in irradiated human lymphocytes. Carcinogenesis 2003;24:1837-45. Squassina A, Congiu D, Manconi F, Manchia M, Chillotti C, Lampus S, et al. The PDLIM5 gene and lithium prophylaxis: An association and gene expression analysis in Sardinian patients with bipolar disorder. Pharmacol Res 2008;57:369-73. Zhuo E, He J, Wei T, Zhu W, Meng H, Li Y, et al. Down-regulation of GnT-V enhances nasopharyngeal carcinoma cell CNE-2 radiosensitivity in vitro and in vivo. Biochem Biophs Res Commun 2012;424:554-62. Lövey J, Nie D, Tóvári J, Kenessey I, Tímár J, Kandouz M, et al. Radiosensitivity of human prostate cancer cells can be modulated by inhibition of 12-lipoxygenase. Cancer Lett 2013;335:495-501. Scopa CD, Vagianos C, Kardamakis D, Kourelis TG, Kalofonos HP, Tsamandas AC. bcl-2/BAX ratio as a predictive marker for therapeutic response to radiotherapy in patients with rectal cancer. Appl Immunohisto Mol Morphol 2001;9:329-34. Raisova M, Hossini AM, Eberle J, Riebeling C, Wieder T, Sturm I, et al. The BAX/Bcl-2 ratio determines the susceptibility of human melanoma cells to CD95/Fas-mediated apoptosis. J Invest Dermatol 2001;117:333-40. Reed JC. Bcl-2 family proteins. Oncogene 1998;17:3225-36. Reed JC. Bcl-2-family proteins and hematologic malignancies: History and future prospects. Blood 2008;111:3322-30. Kang MH, Reynolds CP. Bcl-2 inhibitors: Targeting mitochondrial apoptotic pathways in cancer therapy. Clin Cancer Res 2009;15:1126-32. Amundson SA, Do KT, Fornace AJ Jr. Induction of stress genes by low doses of gamma rays. Radiat Res 1999;152:225-31. Boreham DR, Gale KL, Maves SR, Walker JA, Morrison DP. Radiation-induced apoptosis in human lymphocytes: Potential as a biological dosimeter. Health Phys 1996;71:685-91. Wilkins RC, Wilkinson D, Maharaj HP, Bellier PV, Cybulski MB, McLean JR. Differential apoptotic response to ionizing radiation in subpopulations of human white blood cells. Mutat Res 2002;513:27-36. Korsmeyer SJ, Wei MC, Saito M, Weiler S, Oh K, Schlesinger P. Pro-apoptotic cascade activates BID, which oligomerizes BAK or BAX into pores that result in the release of cytochrome c. Cell Death Differ 2000;7:1166-73. Menz R, Andres R, Larsson B, Ozsahin M, Trott K, Crompton NE. Biological dosimetry: The potential use of radiation-induced apoptosis in human T-lymphocytes. Radiat Environ Biophs 1997;36:175-81. Harima Y, Harima K, Shikata N, Oka A, Ohnishi T, Tanaka Y. BAX and Bcl-2 expressions predict response to radiotherapy in human cervical cancer. J Cancer Res Clin Oncol 1998;124:503-10. Cimmino A, Calin GA, Fabbri M, Iorio MV, Ferracin M, Shimizu M, et al. miR-15 and miR-16 induce apoptosis by targeting BCL2. Proc Natl Acad Sci U S A 2005;102:13944-9. Wilkins RC, Kutzner BC, Truong M, McLean JR. The effect of the ratio of CD4+to CD8+T-cells on radiation-induced apoptosis in human lymphocyte subpopulations. Int J Radiat Biol 2002;78:681-8. Fenech M. Current status, new frontiers and challenges in radiation biodosimetry using cytogenetic, transcriptomic and proteomic technologies. Radiat Meas 2011;46:737-41. Ren R, He M, Dong C, Xie Y, Ye S, Yuan D, et al. Dose response of micronuclei induced by combination radiatison of α-particles and g-rays in human lymphoblast cells. Mutat Res 2013;741-742:51-6. Wolff S. The adaptive response in radiobiology: Evolving insights and implications. Environ Health Perspect 1998;106:277-83.